This is a story about comparing Charles C. Baldwin’s 1881 Baldwin Genealogy to original documents (photographed and appearing on the web) relating to David Baldwin (1734-1824), and questioning the conclusions drawn by the author. Lately, I find myself increasingly able to discern what sources were used to reach conclusions in unsourced books and articles, and to re-analyze those sources myself and perhaps reach different conclusions. After doing this several times, it becomes second nature. I hope. My goal was to learn more about the life of David Baldwin, my fifth great grandfather (in the line of Billerica Baldwins he is: David4, Joseph3, Thomas2, John1). My grandfather is descended from David Baldwin in the following way: Miles Edward Baldwin — Miles Edward Baldwin — Edward Baldwin — Eli Baldwin — Abiel Baldwin — David Baldwin. 83. DAVID 4 Joseph 3 Thomas 2 b. about 1734, probably in Billerica. His father settled in Townsend, and he in Pepperel, Mass. His will, dated 1802, was proved May 2, 1824, by consent of heirs. 205. David. George H. can’t find out about him. 208. Abigail, m. Elias Boutell. of whom two are living in 1876. 210. Elizabeth, m. Abijah Jewett. 211. Hannah, m., after 1802 and before 1824, Thomas Holder. 212. Eliza (not in will), m. Thomas H. Bailey. 214. Silvia (not in will of 1802), m. Boutell. He lived in Pepperel, near the Townsend line. David’s parents were Joseph Baldwin (1702-1747) and Esther Manning (1703-1740). Joseph and Esther were first cousins. The page of Townsend, Massachusetts births which contained their children has been missing from the record book for over a century (per Henry C. Hallowell’s Vital Records of Townsend, Massachusetts (Boston, NEHGS, 1992, page 203)) so I am still piecing that together. Their oldest son, Ebenezer, was “from his Childhood Deprived of his Eyesight in a Great Measure” according to Townsend town selectmen (see probate #836, p. 19). The Selectmen felt that Ebenezer was not provided for adequately in his father’s will, and might become a charge to the town. David’s siblings also included Joseph, Thomas, Reuben and Abel, plus a half sister Thankful (died young). David was six when his mother died, and 13 when his father died. David’s father Joseph also left behind his second wife, Thankful Prescott Baldwin. The inventory showed a well-stocked house and farm in Townsend, including some books, with more farm animals than I normally see. Probate records for Joseph Baldwin (#836, #837, #838, #839, Middlesex County, MA: Probate File Papers, 1648-1871.Online database, AmericanAncestors.org) show that David and his brother Abel went to the custody of two uncles in Billerica, John Baldwin and David Baldwin. David and Abel shared the inheritance of a second farm in Townsend, part of the “Mount Grace” area. I’m not sure how the boys fared, but the guardian of the two older brothers made a special request to the judge to purchase clothes for the older boys who, “by reson of there father’s long illness were exceeding bear ont [barren?] for cloathing”. Perhaps the stepmother was overwhelmed by caring for the sick husband. It’s not really clear to me whether fabric was usually manufactured at home in the 1740’s, or purchased. signatures and seals of David’s uncles John Baldwin and David Baldwin, in Joseph Baldwin’s probate packet. 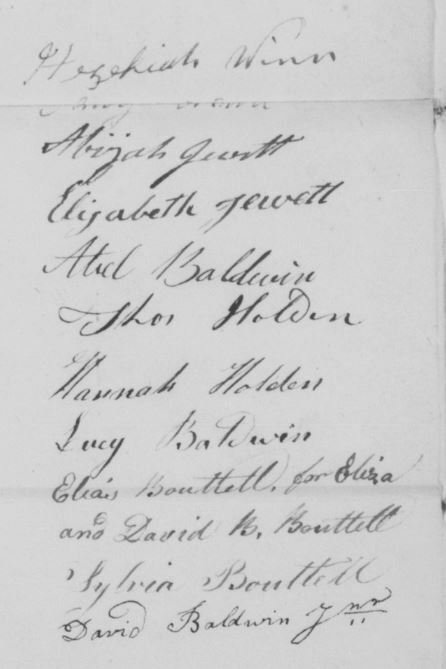 David “of Pepperell” married my 5th great grandmother Elizabeth Boynton (1743-1777) in 1769 and Elizabeth Blood (1743-1790) in 1778, according to Henry C. Hallowell’s Vital Records of Townsend, Massachusetts (Boston, NEHGS, 1992). He was the father of 9 children. David may have served in the Revolutionary War, but there were several cousins by that name, so I’m unsure. I see no evidence that he married a third time. Cambridge is a long way off, and it’s possible that Pepperell residents needed to file deeds there. Or, there could be some other reason for the delays, and some event in 1798 that prompted the eventual filings. These deeds would support David’s Billerica-to-Pepperell path that I read about in the Baldwin genealogy (The Baldwin Genealogy, from 1500 to 1881 by Charles Candee Baldwin, Cleveland: 1881, p. 698-699) but I didn’t get much further information from them. I don’t see deeds late in life or after death that reflect transfers to the children. I eliminated the other David Baldwin deeds for one reason or another, but I may be missing something. The Pepperell birth records (Massachusetts Town and Vital Records, 1620-1988, Pepperell, Book A, p48, from Ancestry.com, image 447 of 1148) show the list of children of David and his first and second wives. David’s children were David, Elizabeth (died young), Abigail, Abiel, Elizabeth, Amy, Abel, [another record intervenes] Hannah, and Lucy. I was interested to see that another record book from the Pepperell set shows the same family again in a cleaned up, more obviously transcribed page in Book B (Massachusetts Town and Vital Records, 1620-1988, Pepperell, Book B, p29, from Ancestry.com, image 552 of 1148). I noticed that this version omits or smudges the “2nd” after the name of the second Elizabeth; a noteworthy difference if someone was not aware there were two wives named Elizabeth. What got this search started were blog posts by Randy Seaver and Bill West about some probate records recently made available online. The probate records of Middlesex County, Massachusetts have been placed on the website of the New England Historic Genealogical Society. To have the packets online is a huge improvement over traveling to East Cambridge, Mass. I just go to the search screen on AmericanAncestors.org (requires NEHGS membership] and use the record set “Middlesex County, MA” Index to Probate Records and (once I know the number from the index) Probate File Papers. 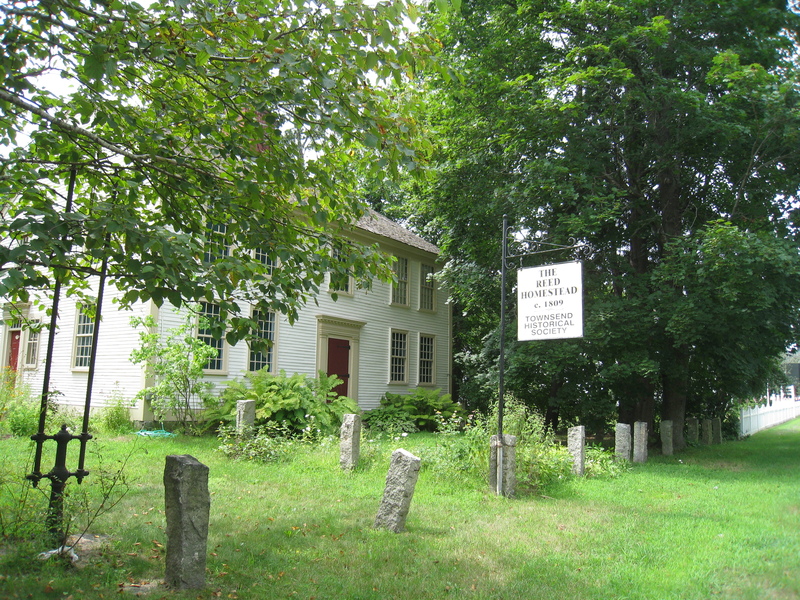 David Baldwin (1734-1824) was a yeoman of Pepperell, Massachusetts. Since his second wife Elizabeth had died in 1790, David was a widower in 1802 when he made the will, and when it was proved in the 1824. No mention was made in the will of any wife, and the estate was divided among the children. David lived to be an old man, dying in Pepperell at age 89. I found the 1802 will of David Baldwin (#812, Middlesex County, MA: Probate File Papers, 1648-1871.Online database. AmericanAncestors.org). In the name of God Amen this second day of August in the year of our Lord one thousand eight hundred and two I, David Baldwin of Pepperell in the county of Middlesex and Commonwealth of Massachusetts husbandman now of sound mind and memory thanks to God therefore, but calling to mind the frailty and mortality of my body and knowing that it is appointed for all men once to die, do for avoiding controversies after my decease make and ordain this my last will and testament. I give and bequeath onto my oldest son David Baldwin Junior the sum of one dollar which together with what he has before received makes up his sole share of my estate. I give unto my second son Abiel Baldwin all my farming and husbandry tools of every kind, also my house together with the one half of all my wearing apparel. I give unto my third son Abel Baldwin the other half of my wearing apparel. I give unto my daughter Abigail now wife of Elias Boutell the sum of one dollar . I give unto my daughter Amy Baldwin the sum of one dollar. I give unto my daughter Elizabeth now the wife of Abijah Jewett the sum of one dollar. I give unto my daughter Hannah Baldwin the sum of one dollar. I give unto my daughter Lucy Baldwin the sum of one dollar. all which sums I order to be paid unto them by my executor in one year after my decease. And I further give unto my said three daughters Amy Hannah, and Lucy all my household furniture of all kinds for ever. And all the remainder of my estate which may consist of money, notes of hand, and live stock. I do hereby order that the same be equally divided and shared between my son Abiel, and Abel, and my daughters Abigail, Elizabeth, Amy, Hannah, and Lucy. And I do hereby nominate and appoint my said son Abel Baldwin soul executor to this my last will and testament. In testimony whereof I the said David Baldwin have here unto set my hand and seal the day and year first above written. Of David’s 9 children, the first Elizabeth had died at age 1, and all others were living in 1802. In 1821, when David was 86, some family members appealed to the court of probate for a guardianship to be established for David Baldwin of Pepperell (#811, Middlesex County, MA: Probate File Papers, 1648-1871. Online database. AmericanAncestors.org). Whereas Hezekiah Winn & others, your friends and children, have represented to the judge of said court, that you are a non compos mentis person & incapable of taking care of yourself and prayed that a guardian may be appointed to you as the Law directs. The guardianship was established and an inventory taken totaling $902. The inventory showed a minimal, rustic set of belongings, such as an old man living alone might have used. No indication was ever given for the nature of the disorder. Although, perhaps “Eight Cyder Barrels” was a clue. John Walton of Pepperell, Esquire, was appointed guardian, and Walter Fiske, Yeoman, and Hezekiah Winn, Yeoman, as sureties. Signatures of heirs in probate record, 1824. It’s interesting that Abel signed the guardianship in 1821, and Abiel signed the probate in 1824. Otherwise, the other five are the same. 205. David. George H. can’t find out about him. David ended up owning a large farm in nearby Fitchburg, in Worcester County. I found an 1830 probate packet for him, #2861, in the Worcester County probate records on FamilySearch.org. The record of the children of his two marriages, to Abigail and, later, Edah Putnam, is found on pages 228 and 227 of Fitchburg Town Records, Births, Marriages and Deaths in the Massachusetts, Town and Vital Records on Ancestry.com. I base my conclusion on him naming a son Abel and the presence of 5 family members among his creditors mentioned in the probate records. 206. Abiel.+ page 707 details my 4th great grandfather Abiel’s life. OK.
207. Abel. George H. says, three sons and two daus. , of whom one dau. is living in 1876. OK. I believe Abel died 1855. 208. Abigail, m. Elias Boutell. OK.
209. Amy, after 1802 and before 1824, m. Hezekiah Wines, and had three sons, of whom two are living in 1876. Amy married Hezekiah Winn. She died in 1846 in Pepperell. 210. Elizabeth, m. Abijah Jewett. He left off the first Elizabeth, but this may have been intentional. 211. Hannah, m., after 1802 and before 1824, Thomas Holder. She married Thomas Holden. 212. Eliza (not in will), m. Thomas H. Bailey. Eliza Boutell Bailey was a granddaughter, not a daughter; the daughter of Abigail. 213. Lucy. It’s possible Lucy never married; she was still single in 1824. 214. Silvia (not in will of 1802), m. Boutell. Sylvia Boutell was a granddaughter, not a daughter; the daughter of Abigail. I believe most of the problem stems from the fact that the author, or the mysterious “George H.” (never explained in the book) only used the probate record #812, and missed probate #811, as well as the Pepperell vital records. And that’s the story of how I was able to make my own analysis of David Baldwin’s family, using the book details only as suggestions. Anyone who reads Middlesex probate records from the first half of the nineteenth century is familiar with the name Judge Fay. I have seen it many times. It occurred to me to look into his history a little bit. 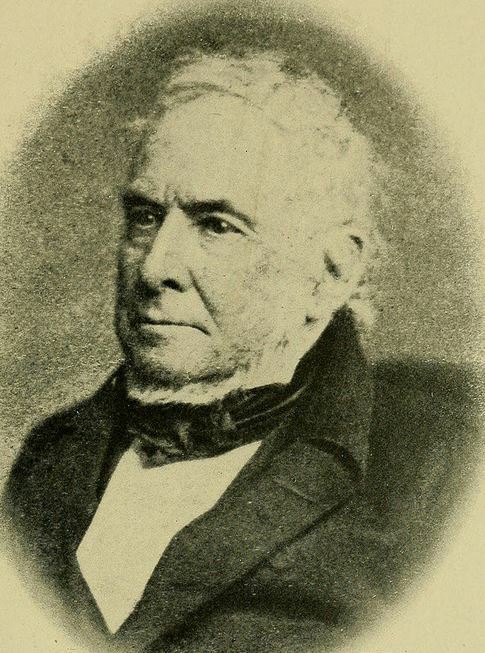 Judge Samuel Phillips Prescott Fay (1766-1856) served as a Middlesex “probate of wills” judge from 1821 – 1856, and also as a trustee of Harvard College and Grand Master of the Masons. From some old Boston families, I assumed he would have had a portrait or photograph taken of himself. Sure enough, I found his likeness on page 193 of Ancient Middlesex with Brief Biographical Sketches by Levi S. Gould (Somerville, 1905). For years I had pictured the judge as if he were Lionel Barrymore playing Judge Hardy in the original Andy Hardy movie “A Family Affair” but in fact he was even kinder looking than that. It’s funny to think of him knowing generations of my family members. At first, I only found and read David’s after-death probate. It was only when I saw a dollar total carried over from “his guardian” that I realized there had been guardianship papers in a different record. Then, I downloaded that document, too (just one number prior). Much head-smacking and a solemn vow to always look a couple of records forward, and back. Even finding a handwritten set of birth records for a family does not mean there’s not a more original version elsewhere in the records. One set looked neat, all in the same hand, and obviously transcribed, which tipped me off to try and find an earlier set. Turns out, the transcription had an important omission. 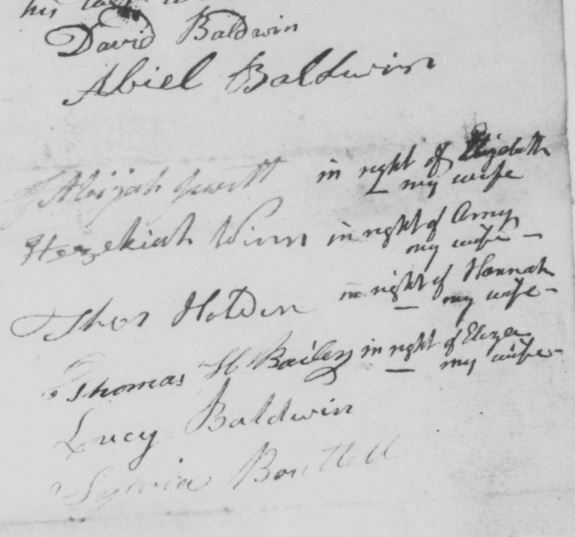 I haven’t mentioned a Sons of the American Revolution record that I found for David Baldwin mentioning his son, David, which was very unreliable, but from that I DID find the name of David Junior’s second wife, and that helped me distinguish among many David Baldwins in northern Massachusetts and find the probate record with the evidence. Even in a bad compiled source, one thing might be right. 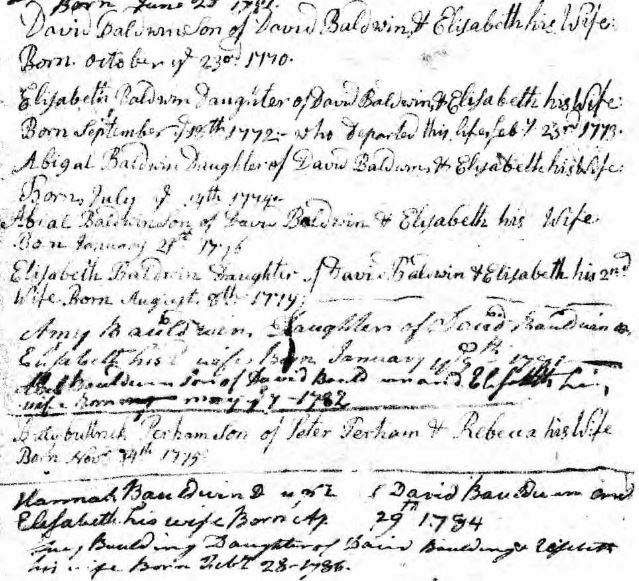 At first I was doubtful that the Fitchburg probate record was for the David Baldwin Junior I was looking for because the farm was so large and worth so much money, and he owned a church pew. Seemed like he couldn’t be my David Baldwin’s son. Then I saw the list of debts to be settled (about half the value of the estate) and I started to believe. Is that wrong? I need to remember that some of my ancestors went to church, probably, and in 1800 even a modest gift from a father to his oldest son could be turned into something substantial. The author assumed, if the husband signed probate and his wife didn’t sign, that she must have passed away. Legally, that’s a bad assumption since the daughter’s share would have gone to her CHILDREN, not her husband. I wonder how many authors were unaware of the way the law affected the records they were using? The Middlesex probate records were from: Middlesex County, MA: Probate File Papers, 1648-1871. Online database. AmericanAncestors.org. New England Historic Genealogical Society, 2014. (From records supplied by the Massachusetts Supreme Judicial Court Archives.) Accessed 9/1/2014.